For more than 15 years the globally known SIGMA Plastics Group has put its trust in recycling machines from NGR, the plastics recycling machine manufacturer from Upper Austria. In December, NGR’s machine number 1,000 was delivered to a Sigma plant New Jersey. Founded in 1996, the Austrian company Next Generation Recyclingmaschinen GmbH provides customized plastic recycling solutions. The systems are manufactured at the headquarters in Feldkirchen and operate in more than 80 countries around the world. With state-of-the-art customer care centers in Europe, the USA and China, NGR is never far from its clients. During the past two decades, more than 1,000 machines have rolled off its assembly lines, including over 100 machines this year. 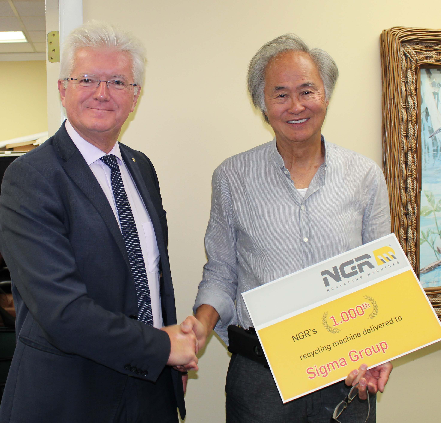 And NGR marked this milestone together with its valued customer, the SIGMA Plastics Group. SIGMA is the largest privately owned film extrusion company in North America, with more than 5,000 employees and an annual processing volume of over two billion pounds. Its product range includes packaging film, stretch film, merchandise bags, garbage bags and garment bags. In December, the 1,000th recycling machine produced by NGR was delivered to SIGMA Group – and with it NGR celebrated a major milestone.